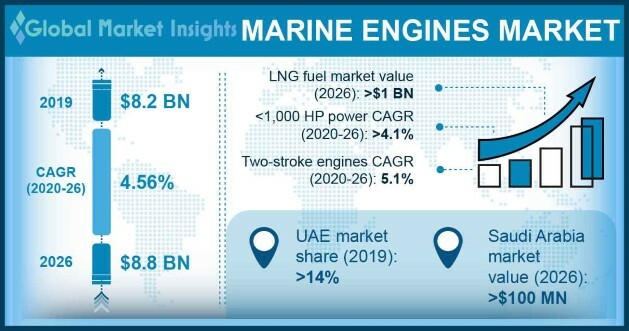 Marine Engines Market size is set to surpass USD 13 billion by 2024, as reported in the latest study by Global Market Insights, Inc. Positive outlook toward seaborne industry and rising maritime trade activities will augment the marine engines market growth. As per the United Nations Conference on Trade & Development, in 2017 the shipping industry handled 80% of the world trade by volume and 70% by revenue through board ships across seaports worldwide. The U.S. market size is predicted to surpass USD 1 billion by 2024. The country, in 2015, introduced IMO tier III norms with an aim to reduce NOx emissions by limiting the usage up to 0.5%. Ongoing R&D to manufacture systems in compliance to the new environmental norms is set to stimulate the industry growth. In addition, continuous retrofitting activities in shipping yards to deploy eco-friendly systems will further foster the product demand. Lightweight and low maintenance requirement are some of the key imperative features which will drive the medium speed marine engine market. In addition, growth in maritime tourism coupled with increasing demand for recreational vessels will positively impact the business outlook. These products are primarily deployed across ferries, cruise and commercial vessels. Ongoing investments toward strengthen the shipbuilding sector will complement the South Korea market. The government, in 2016, invested USD 9.6 billion to enhance its shipbuilding business. In addition, the presence of numerous manufacturers and technological advancements in system design & development will strengthen the business outlook. MDO engines are widely acceptable by ship operators owing to their availability and favorable price levels. However, increasing emission control areas (ECAs) coupled with rising awareness toward emissions may act as an industry restraint. Introduction of norms and regulations to reduce marine pollution has led to an increase in demand for low-emission systems. Industry players, to follow the directive norms, have introduced their diversified product lines with advanced systems including catalytic reactors and scrubbers. Germany accounted for over 18% of the Europe market share in 2017. Growing shipbuilding industry coupled with technological advancements to develop cleaner engines will positively impact the product penetration. The country’s focus on specialized vessels including river cruise ships, mega yachts, wind farm service, military and ro-pax will further complement the industry growth. Low-speed marine engines market size is set to grow on account of large-scale adoption of vessels including cargo, tankers, and bulk carriers. Increase in long voyage trade across the globe coupled with utilization of cost efficient fuel will augment the product penetration. Further, the growth in adoption of products in merchant and container vessels will strengthen the business growth. Key industry players in the marine engines market comprise of Brunswick, Anglo Belgian, Caterpillar, Daihatsu, Deutz, Cummins, John Deere, MAN D&T, Shanghai Diesel, Rolls Royce, STX, Volvo Penta, Scania, IHI Corporation, Yanmar, Wärtsilä, Yamaha, Weichai, and Yuchai.